Rating: 3.5/5 – Cthulu for all ages! 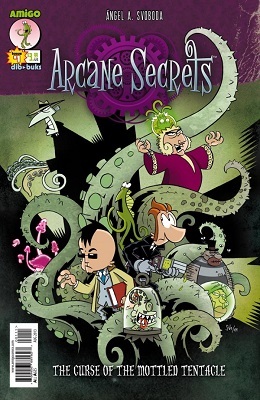 Amigo Comics’ Arcane Secrets is written with the premise of, “The Cthulu Mythos, presented for the whole Family”. From reading that statement you’d wonder how it could work, but surprisingly it does. It takes elements from H.P. Lovecraft’s rich world of Cthulu, and sets it in an all ages book. By using humor, colorful and Cthulu influenced monsters, as well as a visual style that I’d best compare to the Phineas and Ferb cartoon, they’ve succeeded in what they set out to do. The series involves Dr. Ment and his partner Harry investigating arcane secrets and cosmic horrors. And you know…saving the world while they’re at it. This particular issue sees the duo following up on a lead to investigate the Finger of Kurran. Unbeknownst to them, the lead was provided by the mysterious, evil and also funny bad guys of the story who’re trying to bring the cthulu creatures into the world. This investigation leads them into a trap releasing a cthulu creature who when bites you, gives the one in control of the monster, control over your mind. As a funny side effect, it also grows flowers and plants all over your body! It’s things like this that make this book work for the “all ages” they intend it for. It’s written with lots of little side jokes and references to the cthulu universe, and the monsters are cute and fun. At times throughout the first issue though, the sequential storytelling doesn’t always work. Story beats don’t always flow when moving from one panel to another which could leave that younger reader confused as to what happened. In regards to the art, it fits this story so well while the color palette used makes it all pop. By choosing the bright colors they do, greens, pinks and purples, it brightens the subject matter while still giving it that creepy feel. The only complaint I have would be the size of the word balloons. Throughout the book the size of the word ballon is much bigger than what the dialogue actually needs. It’s a minor grievance, but it’s still noticeable. Overall, a fun book that can be read by all ages. I’m happy I gave this book a try, and if you’re a fan of Cthulu, this is a fun and different take on that mythos. This entry was posted in Amigo Comics and tagged Amigo Comics, Angel A. Svoboda, Arcane Secrets, Cthulu. Bookmark the permalink.